Nick Griffin started his stand up career in Kansas City at the age of nineteen. By the time he graduated from college three years later, he was working full time all across the country. He moved to New York City in 1990 cutting his teeth on midnight shows in Greenwich Village. He was poor and alone but getting funnier and funnier. Eventually he relocated to Los Angeles and quickly became a regular at the world famous Improv and The Comedy and Magic Club in Hermosa Beach. During this time, he appeared on a handful of television shows including A and E’s An Evening at the Improv and Comedy on the Road. He also began writing for television. Nick was a staff writer on the Keenen Ivory Wayans Show in 1996. And later a head writer for the Bobby Slayton/Sue Murphy radio show. But his first love was always stand up comedy. In 1998 he was invited to take part in the New Faces show at The HBO Comedy Arts Festival in Aspen. That same year he made his network television debut on The Late Late Show with Craig Kilborn, as well as Comedy Central’s Premium Blend. 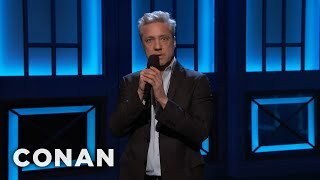 Nick has made multiple appearances on The Late Show with David Letterman, The Late Late Show with Craig Ferguson and the Late Late Show with Craig Kilborn. Lat year Nick taped his own Comedy Central Presents, which is airing this Spring. He now headlines America’s best comedy clubs and is a regular guest on nationally syndicated radioÂ’s The Bob and Tom Show.